Mangaluru, Nov 01, 2015: The editor is likely to pull me up for this; he has always told me that if a dog bites a man it is not news, but if a man bites a dog then that is news. Any way when a dog bites a policeman it is news perhaps. 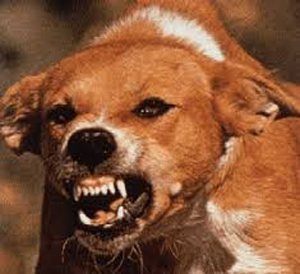 A mad dog bit a police constable and six others persons near Mahalingeshwara Temple in Puttur Oct 31. According to the police, the dog was seen at the Puttur Traffic Police Station earlier in the night where it bit the mat placed at the entrance to the police station. In the morning, the dog bit a police constable from Kadaba Police Station, a homemaker and five others. Those injured went to the nearby government hospital and a few private nursing homes, where they were given anti-rabies vaccine. There were reports that Puttur Town Municipal Council staff had put the dog down.